Give STL Day 2016 will be held May 3. Webster University has been a proud member of the St. Louis Community for 100 years and counting. We look forward to once again joining The Greater St. Louis Community Foundation and hundreds of non-profits in the St. Louis region on Tuesday, May 3. Mark your calendar for Tuesday, May 3, and bookmark the giving link: https://givestlday.org/npo/webster-university. Beginning at midnight and continuing for the next 24 hours on that day, donors can use a credit card to donate to any nonprofit that has registered to participate. Donations begin at $10 and there is no maximum size limit or number of donations accepted. If you have recently made a gift to Webster, we thank you for your support. 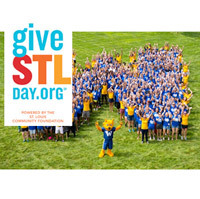 Please encourage your friends, classmates, and colleagues to support Webster on May 3 with a gift in celebration of Give STL Day! Give STL Day is an online day of giving where nonprofits like ours will be reaching out to current and prospective donors to educate them about our mission and raise operating funds. Through a partnership with the St. Louis Community Foundation, Give STL Day generated a total of $2.1 million for the 790 participating nonprofits in our community last year. The Community Foundation launched Give STL Day in 2014, as a way to generate awareness of the myriad of local nonprofit organizations and how they enhance our community and overall quality of life. The inaugural effort of Give STL Day raised more than $1.1 million for 528 local nonprofits. Over the course of the 24-hour period, Give STL Day logged more than 13,000 individual gifts, which ranged in value from $10 to $5,000.